Photo for the Mirror by Chuck Meyers Altoona’s Caranda Perea pulls up for a 3-pointer. TYRONE — Mount Lebanon planned to play a slow-paced, low-scoring fight to the finish in its 6A state playoff opening-round game against Altoona. Caranda Perea’s hot outside shooting threw a massive wrench into that plan almost from the outset. The 6-foot-2 sophomore dropped five 3-pointers on the Lady Devils in the first half for a 26-11 halftime lead, and the Lady Lions went on to a 54-33 win Friday at Tyrone Area High School for their first state playoff victory since 2005. Mount Lebanon started the game in a 2-3 zone to take away Bridgid Fox on the inside and contain Olivia Hudson’s dribble penetration, but Perea went 5-for-5 from the 3-point line in the first half to spark the Lady Lions. Perea hit 3-pointers on back-to-back possessions in the opening minutes to give Altoona the early lead. After Fox scored on a layup off an assist from Jess Stevens, she followed with two foul shots to put the Lady Lions up 10-0 midway through the first quarter. Mount Lebanon, which lost its two previous meetings with Altoona, started the game in a four quarters offense to slow down the pace, but the big, early deficit killed any chance of that approach working. Down 10-4 after one, Mount Lebanon (14-12) pulled to within four, 15-11, in the second quarter, but Perea closed out the half with three more treys and Hudson scored on the fast break to put Altoona up 15 at the break. 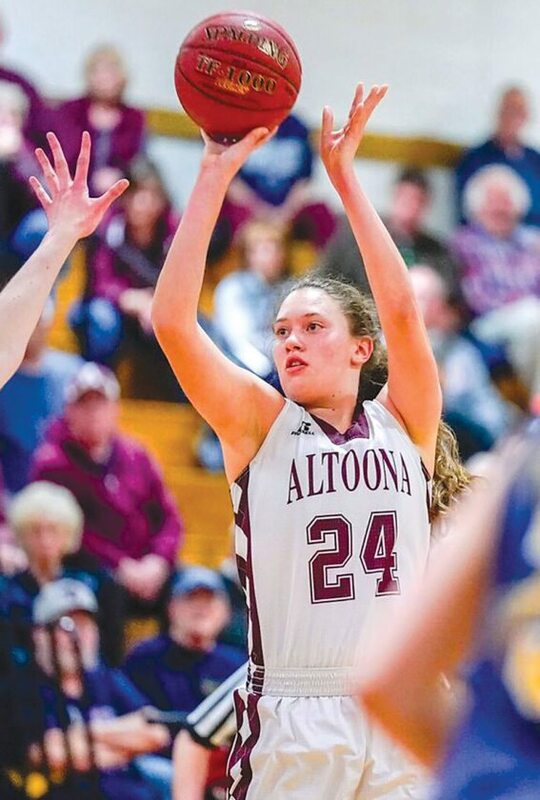 After losing an early double-digit lead in the state playoffs last year, Altoona (21-4) was not content with a 15-point halftime lead, however. Leading 36-19 after three, Fox nailed back-to-back 3s at the start of the fourth, and Hudson followed with a pair of driving layups and a 3 of her own to put the game away. Fox scored 15 of her game-high 21 after the break, and Hudson put in nine of her 11 points in the final two quarters. Fox also grabbed 16 rebounds for a double-double. Perea added a pair of free throws in the second half to finish with 17. Altoona plays North Allegheny in the second round Tuesday at a site and time to be determined. The WPIAL champ and last year’s state runner-up has not lost this year and is ranked No. 1 in the state by PennLive.com. The Lady Tigers have already beaten Altoona twice this season, but the Lady Lions plan to meet the challenge head on. MOUNT LEBANON (33): Kogan 2 2-2 7, Hyland 2 1-2 5, Wilhelm 0 0-2 0, Napoleon 2 2-3 6, Sabol 4 4-6 12, Palmer 0 0-0 0, Kaper 1 0-0 3, P. Smith 0 0-0 0, O’Toole 0 0-0 0, K. Smith 0 0-0 0. Totals — 11 9-15 33. ALTOONA (54): Lear 1 0-0 2, Stevens 0 0-0 0, Hudson 5 0-0 11, Perea 5 2-2 17, Fox 8 3-4 21, Burke 1 0-0 3, Wilson 0 0-0 0, Cherry 0 0-0 0, Corbin 0 0-0 0, Rupert 0 0-0 0, Webber 0 0-0 0. Totals — 20 5-6 54. 3-point goals: Mount Lebanon 2 (Kogan, Kaper); Altoona 9 (Perea 5, Fox 2, Hudson, Burke). Records: Mount Lebanon (14-12); Altoona (21-4).